Find the most amazing, nutrient dense foods NEAR YOU. Whether searching for a new product near home, or while on the road, the integrated mapping will always make finding great foods easy. 12,000 foods all meticulously researched by the experts at Weston A. Price to be the highest quality foods available. Biodynamic or Organic, no artificial colors or flavors, grass-fed, pasture-raised, traditionally prepared. Developed by the Weston A. 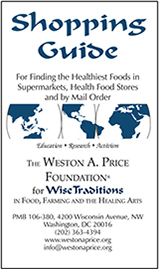 Price Foundation, dedicated to restoring traditionally prepared, nutrient-dense whole foods to the human diet since 1999. Explore more that 15,000 products from 1,300+ brands, all meticulously researched and approved to be among the best available. Learn from other knowledgable consumer’s reviews, and write your own! Find Real Food is independent and free of advertising. Foods are meticulously researched by WAPF experts and chosen solely based on the quality requirements of a traditional diet based on real foods. Your paid subscription includes access to this website AND the mobile app version of "Find Real Food Locations"! Get occasional news and helpful updates about the Find Real Food Guide! the best nutrient-dense real foods nearby.